This is a review of It Works Hair Skin Nails. The manufacturers of Hair Skin Nails claims to make the consumer look more radiant with shinier hair. They also claim this product gives a boost to the natural collagen as well as keratin production, while it defends your body from free radicals and moisturizes the skin while promoting the healthy growth of cells. 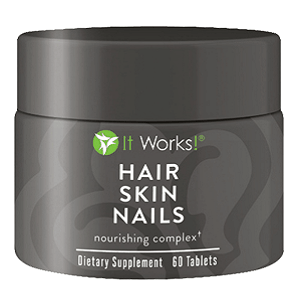 To learn more about It Works Hair Skin Nails, its ingredients, side effects, guarantees and if it may be the right supplement for you, keep reading. The active ingredients of Hair Skin Nails are not listed on the product’s website. After research, it was shown biotin, MSM, and the vitamins E and B6 (which this product contains) have been listed as essential for hair health. The manufacturer recommends taking two tablets a day, and taking them with food. They also recommend drinking eight eight-ounce glasses of water every day you take this product. Some possible side effects are upset stomach, diarrhea, and constipation which may disappear as the body gets used to the product. Allergic reactions are rash, trouble breathing, and dizziness, if these occur discontinue use and see your physician. It is not recommended to take this product of you are pregnant or nursing. This product has a list price of $55 but there is a loyal customer discount which brings it down to $33. To become a Loyal Customer you must register and pay a membership fee of $50 (this fee is non-refundable) unless you choose to get this product auto shipped to you for three months.If you are a U.S. customer you can get free shipping after your first three months. Perk points are earned with purchases which can be traded in for future purchases. There are no guarantees on the product’s website. If you need to know about any guarantees or refund procedures, you can contact them before you make a purchase on the website. This is a product which is considered safe. The active ingredients have been proven to help hair health and regrowth. After research, the feedback from consumers was almost entirely positive. Many consumers claimed to see results quickly, and most were more than happy with the purchase price as they saw results. This product is a bit more expensive than other hair regrowth products. The membership fee is high and non-refundable which is a draw back to getting the product at a lower price. It should be noted It Works Hair Skin Nails is not recommended for pregnant or breast feeding women. Research did not answer if this is a vegetarian friendly product. Even after extensive research, we could not find out where this product is manufactured. This product has no guarantee. John Brownstone	reviewed It Works Hair Skin Nails	on August 3rd	 and gave it a rating of 2.5.